The Green Phone Booth: Garden plans? Spring catalogs are a huge temptation for me - and for my kids. Each winter, the bursts of color that shine from the pages make me want to far exceed my little garden's capacity. I tend to shop organic, heirloom and local for my seeds (yes, it's possible in Indiana), so we just recently placed our first of likely three orders. And I had to chuckle when, just a few days later, our package arrived with a note apologizing for the delay! This year, we're branching out from our usual suspects. Though I'm hoping to avoid a garden full of onions like last year, last season expanded our children's repretoire, with a few surprising additions. So we're adding okra, bok choy, Indiana heirloom tomatoes, and if I can find seeds, ground cherries to our mix. What are you trying out in the garden this year? Do you have a beginners gardening guide on this or one of your sister sites? We plant a pretty unsuccessful little vegetable garden every year and never end up harvesting more than tomatoes and a couple of strawberries. I'm sure I'm doing something wrong, but I have no idea what that is. And I'd love to start from seeds this year -- something I've never done before. Thanks! What a great idea! I'll post some tips next weekend for everyone. I'm in an apartment, but I have signed up for a community garden... space is limited of course and I won't know until May (!!) if I get in. I'm currently just daydreaming and thinking about plans. I don't want to buy a lot of seeds and things if I end up not getting a plot, but I don't want to be to late to the game either. So glad to be thinking and talking about gardening! Glad I saw your post on Twitter. Just ordered my seeds, Roma and grape tomatoes (makes the best roasted tomato sauce), going to try swiss chard, onions, and the garlic was planted before the first frost. Then of course peppers, squash, cucumbers - cannot wait! 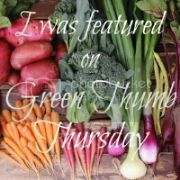 Blog is www.babysmartees.blogspot.com - all about infant stimulation, but also an advocate of homemade baby food - so that as the child gets older they are into veggies . . . from the garden!! You'll be impressed with the way Okra grows here in Indiana! We planted some purple okra from seed last year and just two plants in our square foot garden produced a bumper crop all season long. My seed box is a complete disaster right now so next step for me is to organize and catalog what I have before I go buying even more. That's hard since all the gardening catalogs are beginning to mesmerize me with their loot right now! Jessica - just read your comment - you won't be late - you do not have to start from seed. Check out a local farmer's market for seedlings. They are generally inexpensive and already well on their way to being a productive plant. From those plants you can save seeds for next year and also learn what you like or don't like to grow. Good luck! and Congrats on getting into gardening! Where to begin... I'm redoing my raised vegetable gardens very early this spring, as soon as the ground can be worked. My new crop will be broom corn, just for fun. It's our first gardening year and we are just planning, but starting small. Raised beds with tomatoes, peppers, carrots, potatoes, some lettuce. What seed catalogs are best? I'm going to give it a shot this year - my daughter went through Seed Savers Exchange and picked out some fun varieties of beets, carrots, cabbage, melons, and more ... we are probably being WAY more ambitious than we have right to be, but I figure it's our back yard, it's for the kids, so what the heck? We're in a duplex now, after 12 years in a house with a large garden, and I am *pining* for gardening space! Like another commenter, we are hoping for space in a community garden. But, I am determined to set up a little windowsill garden for herbs and to have a planter or two going near our garage for a few other plants: hopefully tomatoes, peppers, and parsley. @Nathan - thanks for the heads up! would love any tips you have. @Willow - I love rareseeds.com, though, I also shop at Seed Savers, Nature's Crossroads, Botanical Interests and Cook's Garden. At this point, my veggie garden plans for this year are centering around trying to embrace our shade. Our future hopefully holds lots of leafy greens in it. I'm going to have my first 'real' garden this summer I've done a few things here and there but never really anything dedicated. I'm hoping for the veggies we use a lot of. Tomatoes, green onions, yellow onions, green beans and red bell peppers maybe some jalapenos. I will take any hints you give!